With more snow in the forecast for later Wednesday, folks may be thinking back a couple of weeks to the snow event that shut down much of New Bern for several days and left streets and highways coated with ice. But there are big differences between the snow predicted for Wednesday and the snow that fell on Jan. 3. “Snowmageddon” shut down the city for two days and schools for a full week, from Wednesday, Jan. 3, when the mere whiff of snow in the forecast was enough for jittery administrators to stop the buses, through Tuesday, Jan. 9. Country roads were in such poor shape on Wednesday, Jan. 10, that schools started three hours late. Stanley Kite, Craven County Emergency Services coordinator, said the Jan. 3 snow storm was atypical of an Eastern N.C. snow event, with some additional complications thrown in for good measure. There was a long period of freezing temperatures before the snow, setting up a framework for icing that was underlying the snow once it began to fall. Then, days after, the area continued to experience sub-freezing temperatures. That rendered normal processes like road plowing and brine ineffective for clearing roads and keeping them ice free, Kite said. “The NC DOT was in a nonstop battle to keep the main corridors open,” he said. That kept limited DOT resources from venturing out to secondary and local roads. “Most agencies have cut back on equipment. DOT doesn’t have that many, the city of New Bern has only a couple capable of it,” Kite said. Fun fact: Many New Bern “city streets” are actually maintained by N.C. DOT. The city’s primary responsibility are secondary streets and residential streets, with a few exceptions. The state sent additional resources to ENC but they did not show up in Craven County, Kite said. Some were kept in Greenville and Kinston, while the rest was diverted to the Sandhills region, Kite said. Snow rigs aren’t cheap and wind up sitting in the yard unused most of the time. “It doesn’t snow that often and that makes it hard for local elected officials to justify the expenses,” he said. DOT focuses resources on main transportation corridors in order to keep resupply lines open for food and fuel. Because of the continuing battle to keep the main highways open, city surface streets did not receive the attention they normally would. “I heard people had heartburn on Broad Street,” Kite said. Broad Street and other city streets remained coated with ice for days after the Jan. 3 snowfall. Ironically, the streets may have been more passable had they not been plowed, since snow provides more traction than ice. “We had more incidents on Day 3 than on Day 1,” Kite said. On the bright side, perhaps due to lessons learned, the bridges were better managed than what they had been in the past, Kite said. 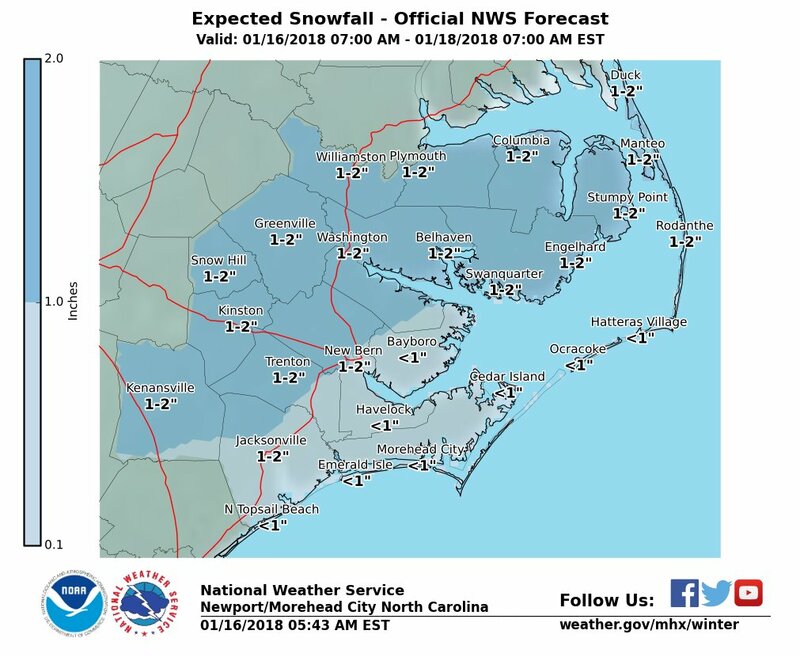 As for tomorrow, Kite said the forecast calls for rain from New Bern to the west on Wednesday morning, turning to snow later in the day, with 1-2 inches of accumulation. But this snow event is more typical of the area. It was preceded by warmer days, and it is expected to get warmer on Thursday, avoiding all of the problems that were associated with the Jan. 3 snow storm.